110v 16A 4 way splitter box. 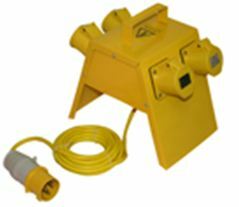 110V Spider splitter boxes that are manufactured from heavy gauge, phosphate treated then powder coated. These units are also available in 24v and 240v. versions. Category: Site Equipment. Tags: Site equipment, splitter box.